“SONG OF OLD WYOMING” (‘45 PRC) Al LaRue (not yet called Lash LaRue) steals the thunder from new Cinecolor singing cowboy star Eddie Dean. Bedecked all in black with a flashy pair of six-shooters on a silver-studded belt—and the whip—LaRue is the one who garnered the overwhelming amount of fan mail. Additionally, the plot revolves completely around his character of the Cheyenne Kid. “CARAVAN TRAIL” (‘46 PRC) Eddie Dean is still the star but Al LaRue (not yet Lash) and Charlie King (in a rare, delightful sidekick role) steal the show from Dean—who has to look to LaRue half the time for guidance. Sub-plot involves LaRue’s years-long vengeance hunt for the man who killed his brother. Cinecolor. “WILD WEST” (‘46 PRC) Easily Eddie Dean’s best, with PRC obviously still building on Al LaRue’s popularity. Arizona Rangers Dean, LaRue and Roscoe Ates are assigned to guard the stringing of transcontinental telegraph wire. Al (soon to be Lash) snakes out his bullwhip a record six times! Reissued in ‘48 minus the Cinecolor and some footage as “Prairie Outlaws”. “LAW OF THE LASH” (‘47 PRC) Billed as “The New King of the West”, Lash graduates from second banana in Eddie Dean films to his own series. Lash’s new director (Ray Taylor) and producer (Jerry Thomas) didn’t quite get the formula right until the second outing leaving their initial entry tame and talky. For his first 8 films, Lash was named Cheyenne Davis. Al “Fuzzy” St. John is his sidekick in every western Lash made. “BORDER FEUD” (‘47 PRC) with his second outing the sultry, black-clad LaRue had tapped into a late ‘40s Saturday afternoon audience that wanted something new. Loose remake of Kermit Maynard’s “Wildcat Trooper”. “PIONEER JUSTICE” (‘47 PRC) Getting even better, roving marshals Lash and Fuzzy help Jennifer Holt ferret out her no-good uncle, William Fawcett. 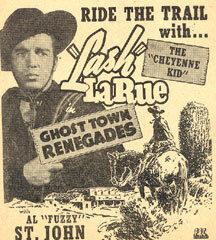 “GHOST TOWN RENEGADES” (‘47 PRC) Not everyone is a Lash fan, but if you are, this is one of his best. Whip use—four times, and Fuzzy has some truly funny moments. Jennifer Holt is once again the leading lady. “STAGE TO MESA CITY” (‘47 PRC) Say what you want about Lash, his films moved and delivered the high action and excitement content Saturday matinee audiences craved. Director Ray Taylor had now hit his stride with Lash. This plot was remade by Whip Wilson in ‘51 as “Stage to Blue River”. Jennifer is along again. 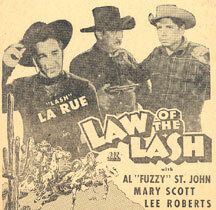 “RETURN OF THE LASH” (‘47 PRC) Lash and Fuzzy aid ranchers to round-up land grabbers. Screenwriter Joseph O’Donnell recycled the amnesia elements from his “Wolves of the Range” (‘43) with Bob Livingston into this script. “FIGHTING VIGILANTES” (‘47 PRC) More standard Lash action. Jennifer Holt in her 4th with Lash. Russell Arms, later of TV’s “Your Hit Parade” is one of the outlaws. Whip use—4. “CHEYENNE TAKES OVER” (‘47 PRC) Lash’s 8th (and last) western for PRC in one action-packed year! By now, Lash truly had “taken over”. At this time, PRC was absorbed by Eagle Lion and the LaRue series discontinued. “DEADMAN’S GOLD” (‘48 Western Adventure/Screen Guild) After over eight months off the screen, Lash and Fuzzy found a new home with producer Ron Ormond releasing through Robert Lippert’s Screen Guild. From now on (with one exception) our hero was always referred to on-screen as Lash LaRue. Former Republic leading lady Peggy Stewart joins Lash and Fuzzy here. Ray Taylor is retained as director for all 6 Screen Guild releases. Doozy of a fight with John Cason. “MARK OF THE LASH” (‘48 WA/SG) No logic at all—typical Lash/Fuzzy thrashing about with usual plot improbabilities. Director Taylor seems more lackadaisical than usual. “FRONTIER REVENGE” (‘48 WA/SG) Director Taylor claims credit for “original screenplay”, but in truth he stole it from “Panamint’s Bad Man” with Smith Ballew which Taylor directed in ‘38. Many of the lines are exactly the same. “OUTLAW COUNTRY” (‘49 WA/SG) One of LaRue’s favorites as he gets to play Lash and his long-lost outlaw twin brother, The Frontier Phantom. Set-up at the beginning with Lash having to battle three deputies to prove himself worthy to a marshal is a direct steal from Sunset Carson’s “Santa Fe Saddlemates”. Extended running time of 71 minutes and a better story makes this one of Lash’s best. “SON OF BILLY THE KID” (‘49 WA/SG) The only picture where LaRue isn’t either Cheyenne Davis or Lash LaRue. Plot theorizes Billy the Kid lived to be a respectable citizen. “SON OF A BADMAN” (‘49 WA/SG) The first half of this is one long Lash and Fuzzy vs. badmen cat and mouse chase. Then we settle down to figure out who El Sombre is. 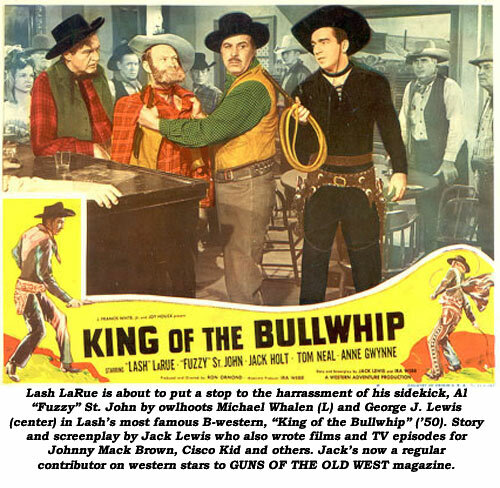 “KING OF THE BULLWHIP” (‘50 Western Adventure) Lash was off the screen nearly 10 months after Robert Lippert reorganized Screen Guild into Lippert Pictures in mid-‘49 and dropped Lash’s westerns. Producer Ron Ormond took over as director as well as producer, with the even lower-budgeted films now being released by theatre owners J. Francis White and Joy Houck through Realart. Nevertheless, this is the best known and most popular of Lash’s westerns sporting a better than average cast—Jack Holt, Tom Neal, Anne Gwynne, George J. Lewis, Dennis Moore. The highlight is the climatic cliff-top whip duel between Lash and El Azote. ZERO “DALTON’S WOMEN” (‘51 WA) Apparently, Ron Ormond put all he had into “King of the Bullwhip”, as this film begins a quick downhill slide for Lash. A tangled mess, advertised as something more lascivious than a Lash B-western. Dancing girls, a barbershop quartet, jugglers, a cat-fight, stock footage from previous films, and the remnants of the Dalton gang. “THUNDERING TRAIL” (‘51 WA) Lash’s last four Ormond-produced and directed westerns are all slash and hack jobs incorporating stock footage from previous films. “VANISHING OUTPOST” (‘51 WA) Only about 15 minutes of new footage spliced into long action segments from 4 prior films. “BLACK LASH” (‘52 WA) If you’ve seen “Frontier Revenge”, you’ve seen most of this. Lash never uses his whip. “FRONTIER PHANTOM” (‘52 WA) 24 minutes of new wraparound footage added to 29 minutes of “Outlaw Country”.